General Comments: - New (2010) series of Hybrid Elatum type Delphinium developed in Japan by the breeder Sakata. 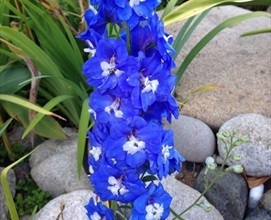 Delphinium are largely available in 2 types: larger bloomed , double flowered "Hybrid Elatum" types or smaller bloomed, single flowered "Bella Donna" types. Bella Donna types have a distinctive pointed spur, which looks a bit like a witch's hat. 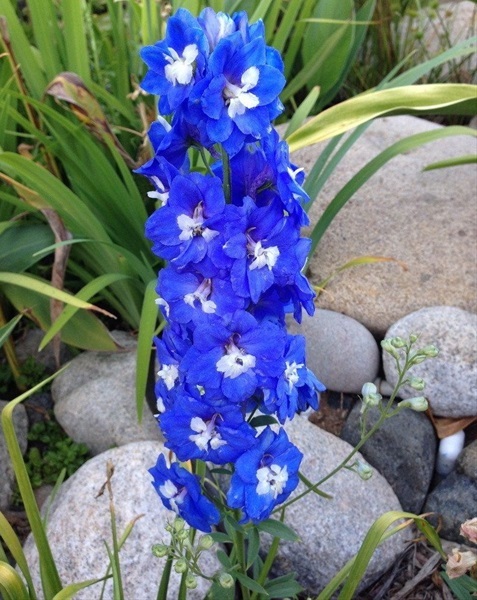 It is important to purchase only STS treated delphiniums to avoid flower shattering. Should be re hydrated using a commerical hydration solution such as "Quick Dip" or "Rose Pro Hydration" . Ask for delphiniums that have been shipped in procona water packs for longer vase life. Hybrid "Elatum" type Delphiniums are graded by stem length and are usually bunched by 5 stems. Bella Donna types (including Volkerfrieden and Waltz) are graded by stem length and are usually bunched by 10 stems. Delphiniums are highly prone to shattering and must be post harvest treated with a strong STS pulse. Special post harvest products exist for treatment specifially of Delphiniums. Foliage should be dark green and free of blackening and powdery mildew. Foliage should be removed from the bottom 20 cm of the stems.